Facing mounting criticism over its Medicaid work requirement, the Arkansas Department of Human Services announced Wednesday that enrollees will be able to report their compliance with the mandate over the phone rather than solely through an internet portal. Starting Dec. 19, adult who aren't disabled and enrolled in the Arkansas Works Medicaid expansion program will be able to report by phone to DHS or their Medicaid managed-care plan on their compliance with the state's so-called community engagement requirement. Enrollees will be able to call the state from 7 a.m. to 9 p.m. seven days a week. The state requires adult enrollees who aren't disabled and ages 30-49 to put in 80 hours per month of work, job training, classwork or volunteer activities to continue receiving coverage. Enrollees ages 19 to 29 will have to start reporting in 2019. DHS said staff working the new help line will assist beneficiaries in meeting their 80-hour requirement and refer them to helpful services. "We are six months into this new Medicaid demonstration program, but wanted to take the time now to (assess) what areas we need to shore up or improve," DHS Director Cindy Gillespie said in a news release. As of the end of October, nearly 13,000 Arkansans had been dropped from coverage due to not reporting that they met the community engagement requirements for three months. As many as 6,000 more people, who had not met the reporting requirement for two months, may lose benefits as of the end of November. 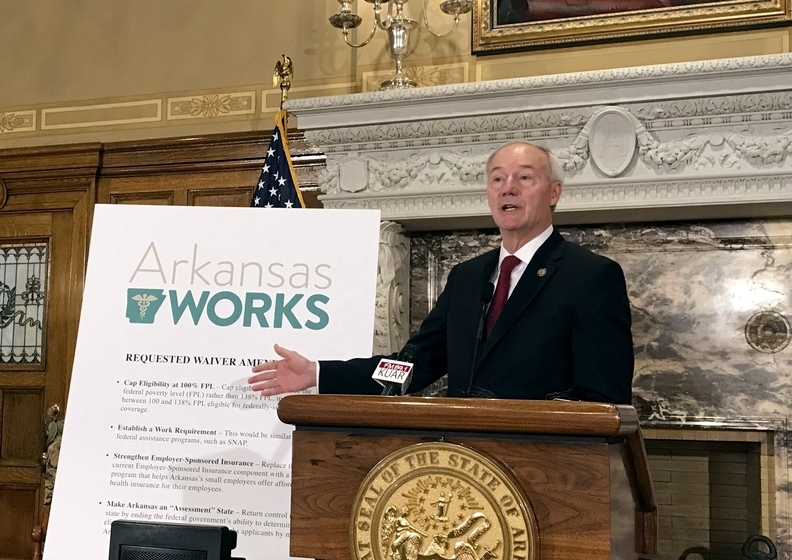 The rocky Arkansas rollout, with its substantial coverage losses, has alarmed state officials, providers, Medicaid plans and patient advocates in other states that are about to start or are considering similar work requirement programs. It's the first-ever state to require Medicaid beneficiaries to work as a condition of coverage. Arkansas is the only one of the five states that have received a CMS waiver to impose a Medicaid work requirement with an internet-only reporting system. That has been partly blamed for the growing number of Arkansans who have been disenrolled for failure to report that they met the requirement. As many as one-third of Arkansans who are subject to the work requirement may lack internet access, researchers say. In addition, healthcare providers and advocates say the state reporting portal is difficult to log into and use. The Medicaid and CHIP Payment and Access Commission recently urged HHS Secretary Alex Azar to halt disenrollments pending closer examination of the structure of Arkansas' program. CMS Administrator Seema Verma recently indicated her agency was closely watching the Arkansas experience and that the state might make changes. "We're in discussion with them to make sure that the implementation is going smoothly," Verma said during a news briefing last month. "We are looking closely at the people that have left the program to understand the reasons why they have left the program, and I think that's going to give us a lot of lessons learned." MaryBeth Musumeci, a Medicaid policy expert at the Kaiser Family Foundation who has studied Arkansas' work requirement rollout, said adding a phone reporting option is "somewhat positive" but that much will depend on how easy the phone system is to navigate. She tried calling the toll-free line Wednesday and found that it appears to have a lot of layers of phone tree features. But the biggest problem she and her Kaiser colleagues found is that most Arkansas Works enrollees don't even know they have to report their hours of community engagement. "Everyone agrees that both the state and the Medicaid plans have done quite a bit of outreach," she said. "But it hasn't been as effective as hoped in reaching people." The CMS and the states have to find a way to enable Medicaid enrollees to report their community-engagement activities "that doesn't require extraordinary efforts by individuals," said Joseph Antos, a conservative health policy expert at the American Enterprise Institute. Kevin De Liban, an attorney with Legal Aid of Arkansas, which filed the suit challenging the Arkansas waiver, said adding a phone reporting option is "like fixing a leaky faucet on a sinking ship." The state's work requirement has caused thousands of people to lose access to physician and counseling appointments and prescription drugs, and has caused them to miss work as a result, he added. "Those are the real costs of this disastrous program," he said. "Instituting a phone line that probably won't work very well isn't fixing the real issue." Meanwhile, U.S. District Judge James Boasberg in Washington is hearing a lawsuit challenging the CMS' approval of the Arkansas Medicaid waiver permitting the community engagement requirement. The U.S. Justice Department and the state of Arkansas recently filed answer briefs in the case defending the waiver. In June, Boasberg invalidated the CMS' approval of a similar requirement waiver in Kentucky on the grounds that the agency did not adequately consider its impact on coverage. In response, the CMS held a new public comment period on the Kentucky waiver and recently re-approved it in identical form. Another legal challenge is expected.